We believe you will find this concluding series question and answer session to be interesting, practical, and helpful. Questions taken from the audience are answered by a panel consisting of Christian Life's pastor, an elder and lead financial trustee, and the Financial Management Life Group hub leader. Questions and answers include, but are not limited to, whether money is good or bad, debt, bankruptcy, budgeting, tithing, and proving God. God wants us to believe the right things about provision, partnership, and prosperity so life in His Kingdom will work for us. We can sincerely believe the wrong things and life simply won't work. We often defend our wrong beliefs with an assertion that "God knows my heart," but sincere belief in wrong principles makes no difference in the outcome. His provision is what He does for us. Partnership is what we do with God. His prosperity is what He does through us for His Kingdom when we follow the two previous principles. His prosperity is not about greed, but generosity and overflow resulting from His blessings. These are life changing principles. Does God want us to be rich? Or, does God want us to be poor? The amount of money God wants us to have depends on two things: 1) God's call on our life, and 2) the principles of finance and resource. At some point in time, we need to do a heart check: do I have money, or does it have me? We need to learn to make major decisions based on what God tells us and not based on whether it is a good deal or not. If we don't place a lid on our budget, we will end up spending all of the increase God provides on ourselves, and not on His work. We live in two kingdoms; the Kingdom of God and the kingdom of man (money). The kingdom of man says we need four things to be happy: power, recognition, success, comfort. God is concerned about what has you, not what you have. If we are stuck on these four things, we are competing with everyone else for them. If we follow the way Jesus outlined for us, we are free to be who He made us to be. 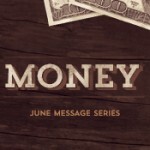 Money simply becomes a tool in the Kingdom of God. Jesus talked about money more than any other author in the Bible. He used money examples more than anything else. He didn't talk about it because he wanted everyone rich; He wanted everyone to understand the basic principles. We live in two kingdoms, each with their own set of rules. We need to know and understand both sets of rules because we live in both kingdoms. We need to understand the differences between wealth, riches, and money.